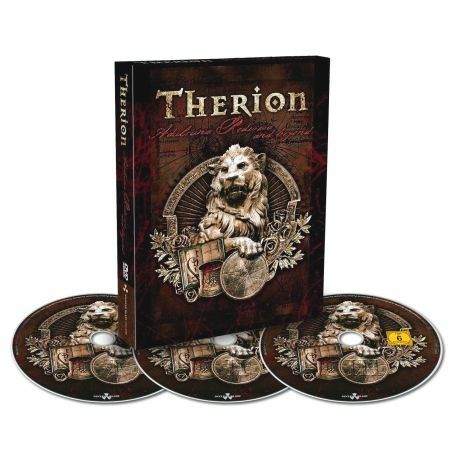 THERION - ADULRUNA REDIVIVA AND BEYOND DELUXE EDIT. (3DVD DIGI-BOOK) | Online Shop | Wizard LTD. Album: "ADULRUNA REDIVIVA AND BEYOND DELUXE EDIT. (3DVD DIGI-BOOK)"
- NUCLEAR BLAST EXCLUSIVE 30 YEARS ANNIVERSARY CAMPAIGN! ЕДНОКРАТНО НАМАЛЕНИЕ!! СЛЕД ИЗЧЕРПВАНЕ НА ОПРЕДЕЛЕНИТЕ КОЛИЧЕСТВА ЦЕНАТА СЕ ВРЪЩА НА СТАРОТО НИВО! The double live DVD + bonus DVD, limited edition Digipak called »Adulruna Redivia And Beyond« contains 2 shows which were recorded live in Atlanta in 2011 and in Budapest 2007. “The concert recorded in Hungary was a concert on the “Adulruna Rediviva” 20 year Anniversary-Tour in December. The idea of the tour was to play the entire Theli album + a set consisting of songs that the fans had voted for on the band web page. Piotr Wawrzeniuk and our old friend Messiah Marcolin joined in to make this evening extra special. The concert in Atlanta was the band‘s only show in the USA since 2007 and was shot during the band‘s headline performance at the ProgPower festival 2011”, commented the band. “011 is the name of a board game made by the italian game manufacturer Scribabs. In a very ambitious way to market the game, they made this fantastic short film, starring the band members as actors, playing their roles in the game. The main man behind the game and the film, Paolo Vallerga, is currently writing a novel on the story behind the game and there are even some plans for a movie.